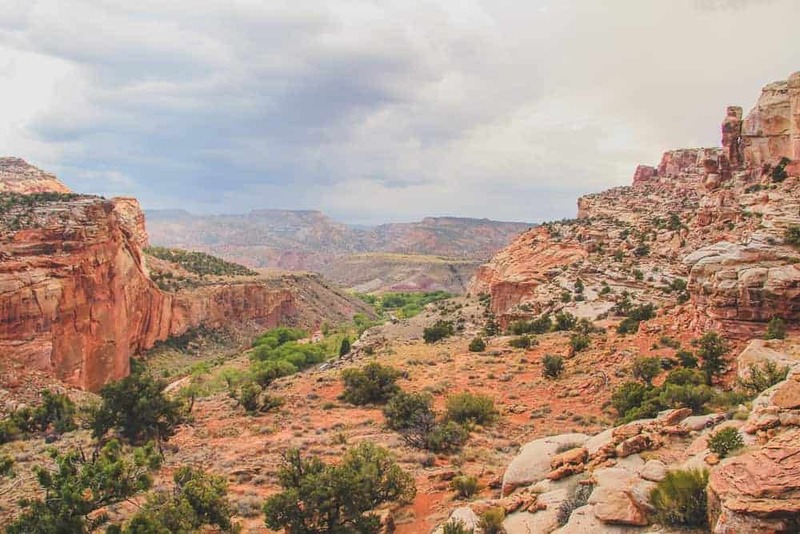 Capitol Reef is one of Utah’s Mighty 5 national parks right in the middle of the state. 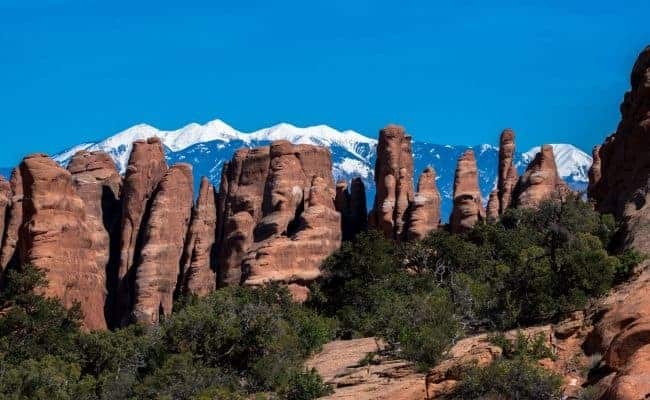 It isn’t terribly close to another park, like Arches and Canyonlands that are both near Moab, Utah and only 26 miles apart. Or Bryce Canyon and Zion in Southern Utah that are about 70 miles apart. Capitol Reef National Park tends to get overlooked. I didn’t visit Capitol Reef on either of my Southwest road trips, and only went after I moved to Utah and lived less than two hours from it. Capitol Reef is now one of my favorite national parks because of the variety of activities. There is so much hiking do to in Capitol Reef between Fruita and the Waterpocket Fold in the south. I chose a few hikes from both areas that are must-dos on a visit to the park. 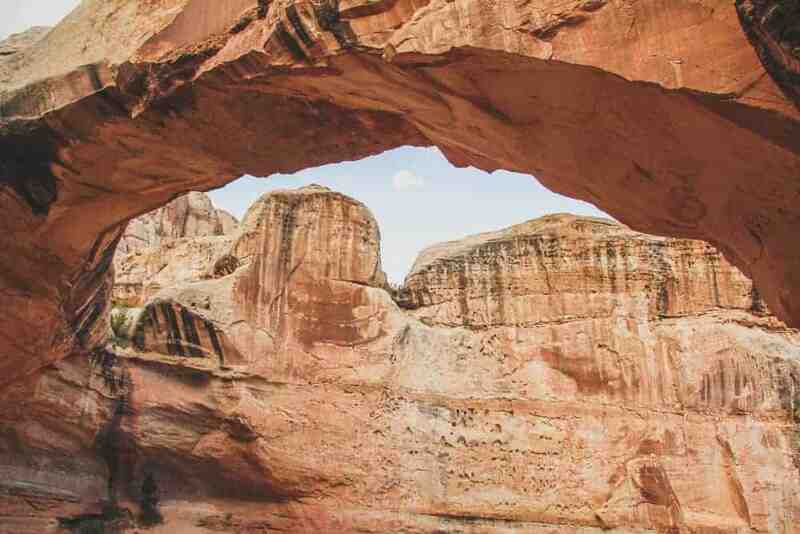 Hickman Bridge trail is one of the more popular Capitol Reef Hikes. This was one of the first hikes I did in the park. I had driven past it so many times and had no idea where the trail even went. Eventually, I stopped and did the hike and loved it! The hike begins with some smaller switchbacks before leveling out a bit. The trail continues along a wash then climbs a little higher with walls starting to tower over you. At the fork in the trail I recommend going to the right, but both will take you to the bridge. It’s just a loop. Soon you will see the view of the bridge. Continue on under the bridge and you’ll be greeted with one of the best (I think) views in the park, overlooking the desert and cliffs below. This Capitol Reef hike is just under two miles. It’s not a super tough hike, but there is some elevation gain which gives it a rating of moderate on the hiking scale. 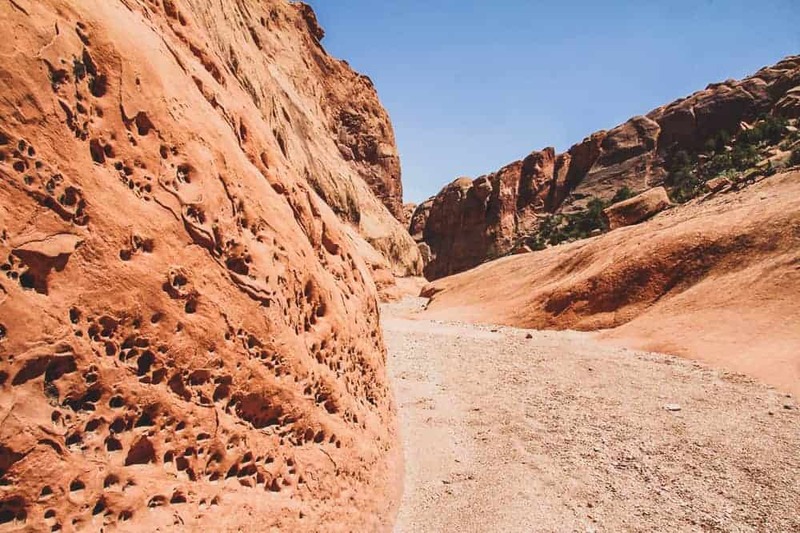 Sulphur Creek trail is Capitol Reef’s version of Zion’s Narrows. They’re the same concept, but don’t go into Sulphur Creek expecting to see what Zion has. It’s totally different, but it’s just as cool. Access the trailhead for this Capitol Reef hike across from the Chimney Rock trailhead. There is a little sign in the wash and you just follow that. As you walk along the Sulphur Creek trail (read more about my adventure), you’ll hike through the Goosenecks and apparently you can look up to see the viewing platform, but I didn’t see it. I wasn’t sure where to look though. Eventually, you’ll come to the confluence and you’ll want to go left. This is where you’ll be getting into the water. From here you just follow the creek until you get to the visitors center. There are three waterfalls you kind of have to scramble down, but it’s nothing super difficult. This is a pretty long hike though. I would recommend a full day for it. It’s 5.5 miles on the trail, which is actually a route, not a marked trail, plus three miles back to your car at the trailhead. If you have two cars leave one at the visitors center then take the other to the trailhead. If you have a bike, leave that at the visitors center so someone from the group can bike back to get the car. If you’re comfortable with it, you can hitchhike back to the trailhead. If none of that is possible, you’ll just have to walk. We started walking back, then got a ride from a family we saw a couple times while we were hiking. 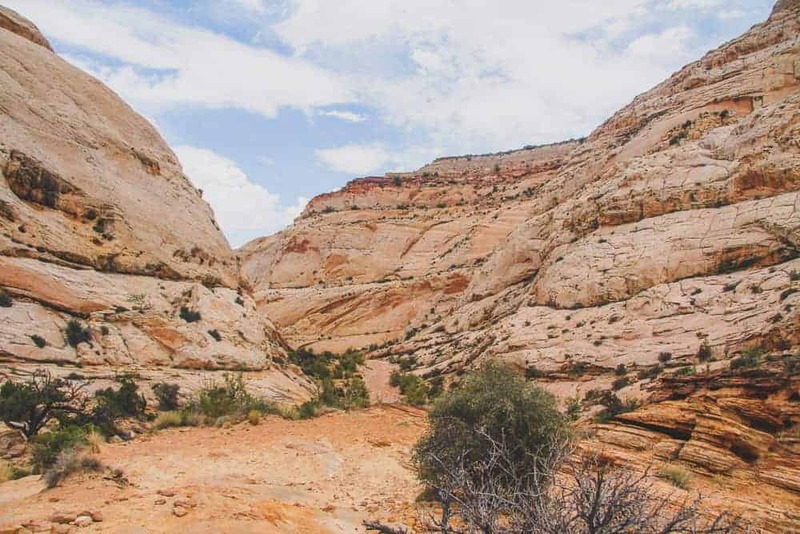 Looking for an easy Capitol Reef hike? Walk along the Capitol Gorge trail. If you take the scenic road all the way to the end, then continue on the dirt road, you’ll get there. I had a Smart Car the first time I drove down here. We only went part of the way since we didn’t know what the road was like, but after going back with a Ford Escape, I realized it would have been fine in the Smart Car. 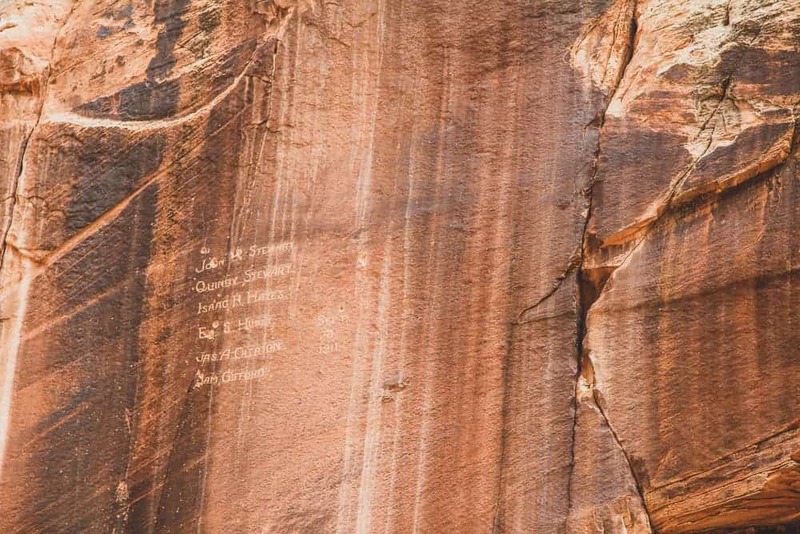 There is a trail that runs parallel to the wash, eventually going into the wash. On the right, you’ll see a few names carved on the wall. This is the start of the Pioneer register. It’s up kind of high, so watch out for it. On the left keep an eye out for some petroglyphs. There is a sign pointing them out. Further down on the left there will be more names (new and old, please don’t carve on the rocks anywhere) from the pioneers that first went through the area. You can see evidence of old phone lines going through the gorge as well. Toward the end of the walled canyon there will be a sign and cairns on the left leading to the tanks. The tanks are cool to see, especially when they are filled with water. The views are pretty good up there. Keep an eye out for big horned sheep on the rocks in this area. This isn’t a super long hike, just around two miles round trip. If you’re not in super awesome shape (like yours truly) the trail up scrambling over rocks might be a little hard on the lungs. 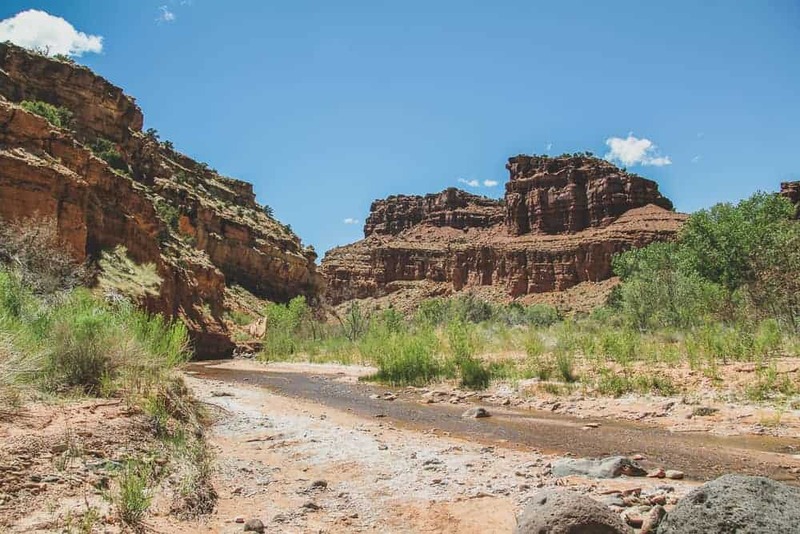 Down in the Waterpocket District, you’ll find the backcountry hiking. 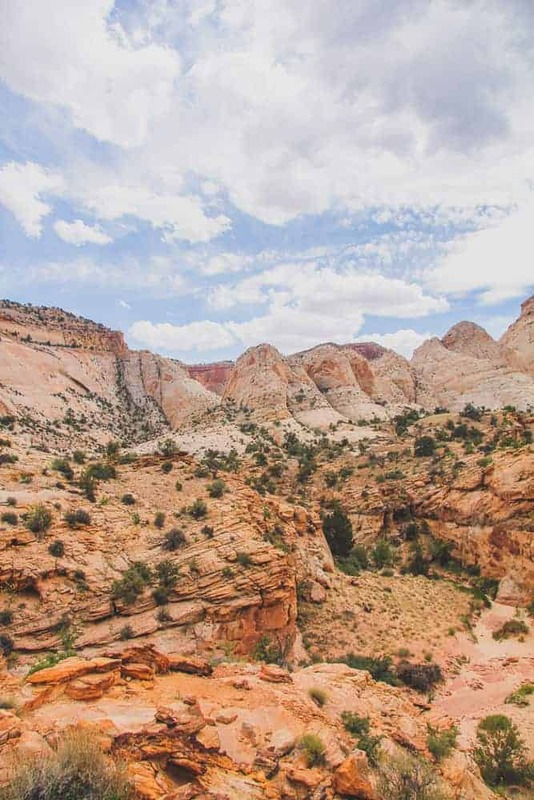 These Capitol Reef hikes see a lot less visitors, but this area is just as wonderful. Lower Muley Twist is a long hike, about 22 miles, but it’s fun to just do part of it if you’re limited on time. I would suggest starting at the trailhead on Burr Trail, at the top of the switchbacks. A lot of it is just hiking in the wash, but you’ll find awesome scenery and towering canyon walls around you. Just be cautious of flash floods in the summer and keep an eye on the weather so you don’t get caught in a storm. Capitol Reef National Park includes the Cathedral Valley Loop. This is a remote and much less visited area of the park. It’s north of the Fruita District and requires high clearance, four wheel drive. Check at the visitor center for current road and weather conditions before visiting Cathedral Valley. Foot and vehicle travel in the Cathedral Valley area is light, so be prepared for the unexpected. If you have problems, help may not arrive for hours or even days, depending on the time of year. Carry plenty of water, food, gas, adequate clothing, a shovel, and emergency supplies. Cool or cold temperatures will accompany sudden storms or an unexpected night out in the backcountry. Daytime temperatures in the summer may reach the upper 90s°F (30s °C) and winter highs may stay below freezing, so prepare accordingly. You are responsible for your own safety. There are plenty of opportunities for hiking and side trips in Cathedral Valley. Check out the gypsum sinkhole, stop at Glass Mountain, and admire the sandstone monoliths in the area. A favorite Capitol Reef activity is getting pie and ice cream at the Gifford Homestead. This is a fun stop, especially on a really hot day. As the Park Service says, “The house depicts the typical spartan nature of rural Utah farm homes of the early 1900s.” It’s an old farmhouse that now sells homemade goods from local artisans. They have delicious ice cream, salsa, cookies, and of course, pie. Also, the cinnamon rolls are delicious! They have a few tables outside to enjoy your treats. Keep an eye out for deer in the grassy areas around the farmhouse. Sometimes they’ll be around the apple trees. I finally got to pick fruit from the orchards in the park and loved it! It might be one of my favorite things to do at Capitol Reef National Park. 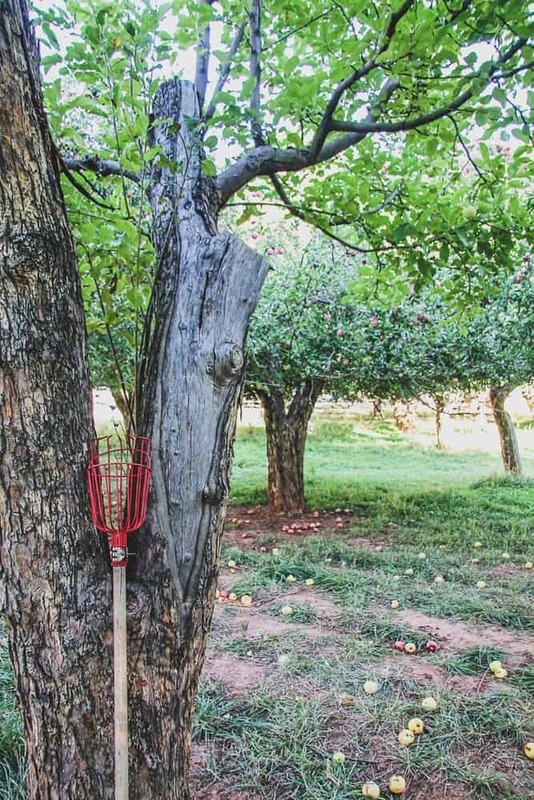 There are tons of orchards scattered around the Fruita District and depending on the time of year, you can go pick the fruit yourself. They have apples, pears, cherries, apricots, and peaches. There is a harvesting schedule to see if there will be anything in season during your visit. You can eat as much as you want while you’re in the orchard and anything you take with you is around $2 per pound. There should be a sign in the orchard. It’s really fun to use the pickers to get high fruit and walk around looking at all the trees. I hope you enjoy the Capitol Reef hikes and activities I’ve shared. Capitol Reef is one of my favorite parks in Utah, and one of my favorite national parks overall. 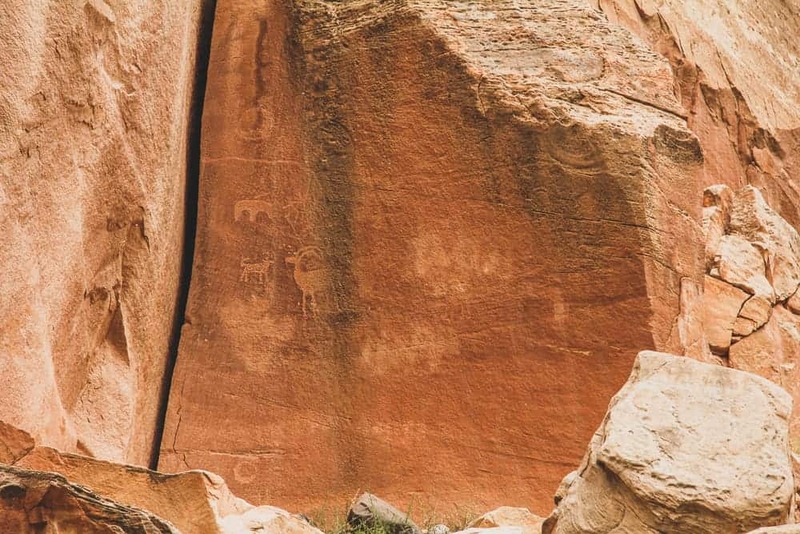 In the Capitol Reef Fruita District, before turning off for the visitors center, there is a short boardwalk along the road leading to some petroglyphs. It’s a nice, easy stop to see some pretty cool stuff. They can be a little hard to spot, so keep an eye out. There will be one pretty high up at the beginning of the boardwalk, the rest are closer to eye-level, but can be hard to see. If you can’t find them, don’t be afraid to ask someone else out there. This is the perfect stop after a long hike or fresh pie. RELATED POSTS: Yes, the National Park Pass is Worth It! When hiking in Capitol Reef, your safety depends on your good judgment, adequate preparation, and constant awareness. Your safety is your responsibility. Carry a Capitol Reef Map when hiking. 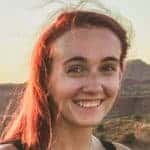 Falls from cliffs on trails can result in death. Loose sand or pebbles on stone are very slippery. Be careful of edges when using cameras or binoculars. Never throw or roll rocks. There may be hikers below you. Avoid narrow canyons when storms are threatening. The Utah desert is an extreme environment. Carry enough water, one gallon per person per day. Drinking water is available at the visitor center, picnic area, and campground. Do not drink untreated water. We like to use hydration backpacks. Flash floods can be caused by run-off from intense, localized thunderstorms that drop a large amount of rain over a short period of time. They are most common in July, August, and September, but can occur at any time of the year. Check the visitor center for current Capitol Reef weather conditions. Heat exhaustion occurs when the body loses more fluid than is taken in. Signs of heat exhaustion include nausea, vomiting, fatigue, headaches, pale appearance, stomach cramps, and cool clammy skin. If a member of your party begins to experience any of these symptoms, stop your hike immediately. Find a cool, shady area and have the victim rest with his feet up to distribute fluids throughout his body. It is important to drink fluids, but it is also important to eat. While suffering from heat exhaustion, drinking fluids without eating can lead to a potentially dangerous condition of low blood salt. If heat exhaustion symptoms persist, seek medical help. Heat stroke is an advanced stage of heat exhaustion. It is the body’s inability to cool itself. Symptoms include confusion, disorientation, behavioral changes, and seizures. If you believe that a member of your party is suffering from heat stroke, it is imperative to cool them using any available means and obtain immediate medical assistance. We always stay at the Capitol Reef Resort. It’s right outside the park and provides a variety of unique accommodation options like rooms, cabins, wagons and teepees! They have many activities for the family. We like that it’s so close to Capitol Reef! I didn’t even know there was a Capital Reef in Utah. It’s so beautiful. I love that it’s not crowded. I avoid a lot of places just because of crowds. I will have to check this out and grab a piece of pie if we’re in the area. We also try to avoid the crowds. And yes, Capitol Reef gets overlooked in Utah. But once people visit the park, it becomes a favorite. What a fascinating series of hikes! They look so beautiful, and it’s great to get so much good information in this post, so thank you. I’ll definitely be using the advice when we go! Thank you. It’s a wonderful national park that doesn’t have the crowds like the other more ‘famous’ ones in Utah. I did a 9 day road trip in Utah and I had to skip Capitol Reef as I wanted to ensure I didn’t rush through the places I’ve been wanting to explore for years. I fell in love with Utah and cannot to go back on a much longer road trip to take it all in. Saving this for later when I can make it to the park. Thanks for the great tips! 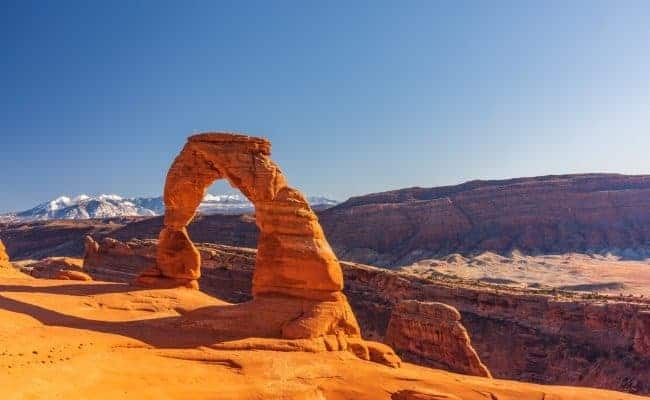 Believe me, I live in Utah and struggle with trying to visit all the amazing places here. I hope you can return one day! I loved Utah when we travelled there last year. We explored Zion but had not enough time for any others. Great excuse to go back! I live in Utah and STILL haven’t seen and explored everything here. I wish everyone could visit Utah and see it’s diverse beauty. Thank you. Ooh, I will have to remember the apple picking in the fall…sounds fun! I’ve skirted this park many times, and been to all the other NP’s in Utah, but haven’t visited Capital Reef yet! Capitol Reef is awesome because it’s far less crowded than the others. It’s worth the time to head out there, even for half a day! This is gorgeous! I love the authentic petroglyphs. So much history in these trails. Yes, the history of National Parks is always so cool! Hickman Bridge is beautiful. Maybe we can add this park to our cross country trip, which I am hoping will happen in the next few years. Picking fruit looks like a fun part of the experience!